The Place Since opening in late 2017, Say Chiizu takeaways kiosks have been mushrooming throughout the island, with branches at VivoCity, 313@Somerset, White Sands Shopping Centre, The Clementi Mall and the latest being at Waterway Point. Come March 2018, you can enjoy your Hokkaido Cheese toasts at a Say Chiizu Cafe opening at Bugis+ and they will be rolling out a series of cafe-exclusive menu items! The Food Before you assume that Say Chiizu originates from Hokkaido, Japan, the brand actually hails from Bangkok, Thailand! Their signature item is definitely the Hokkaido Cheese Toast (S$3.80) which comes in four flavors currently, the Original, Charcoal, Chocolate and Matcha. All done with toasts and melting hokkaido cheese inside, they are pan-grilled to achieve the ideal crisp texture and a stretch-friendly cheese. My favorite is the original flavor, where you can best enjoy the quality Hokkaido cheese. The Charcoal rendition gets you a charcoal bread with the same cheese inside, whereas the chocolate flavor gives the bitter-sour taste profile with the mix of chocolate and cheese. At S$3.80 each, the toast seems slightly small, although it is very satisfying I must admit – though rather sinful with the pan-grilling of the toast and with the melting cheese. A new item on the menu for the Cafe is the Super Long Fries – Big Bear Size (S$5.80, add S$2 for cheese). The fries comes either with Wasabi Mayo sauce or Onion Mayo sauce, and you can enjoy the fries with free additional powder seasonings, including BBQ, Sweet Corn, Sour Cream, Seaweed and Original Cheese. Our favourite is the sweet corn powder, although we feel that the fries are good enough on its own. For some meats, you can opt for the Chicken Mid Joints (S$5.80, add S$2 for cheese) or the Chicken Bites (S$4.80, add S$2 for cheese). Admittedly, both are not the best rendition of chicken snacks we have had. Between both, go for the Chicken Bites, as we find it more palatable; whereas the mid-joints are nothing out of the ordinary. We were told that the cafe will be introducing Cheese Tea (S$3.20) when it opens. Staying true to its origins from Thailand, the tea will be Thai Milk Tea, with the drink topped with unique cheese foam made of cream cheese and whipped cream. Sounding like the signature selections of a certain bubble tea shop in Singapore? Although anything-Thai Milk Tea is definitely worth a try in Panda’s opinion. Rants The space is rather small, with only 15 seats in the new cafe. Will I Return Again? 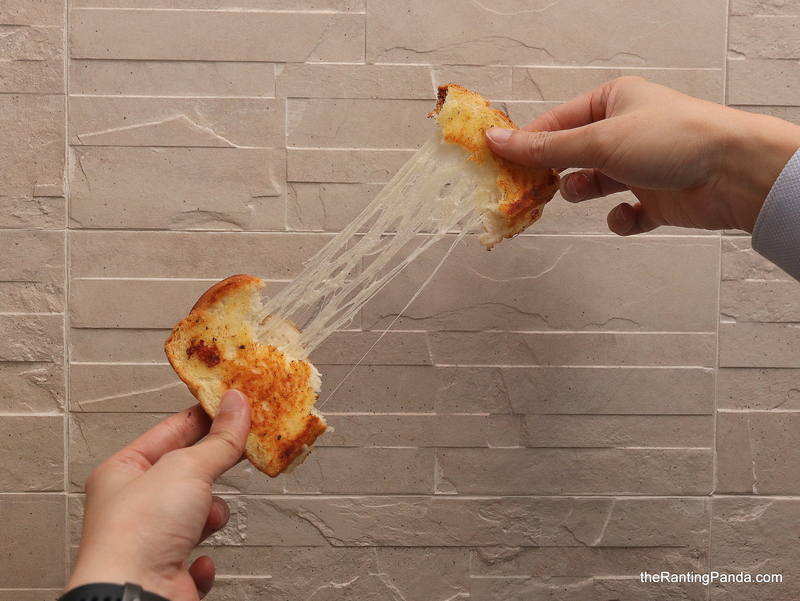 For the cheese toasts, a definite yes. We had three original cheese toasts at one go, and was silently wishing for another one.